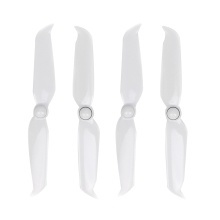 The propeller set is designed for DJI Phantom 4 PRO V2.0 RC drone, featuring with high quality and durable performance, and can effectively reduce noise during the flight. It is the best choice for you to have fun. PS: the drone in the picture is not included. The replacement propellers are designed for DJI Phantom 4 PRO V2.0 drone. Made with high quality plastic for maximum performance, durability and balance. It can effectively reduce friction resistance with air. It is a de-noising and quick-release propeller.